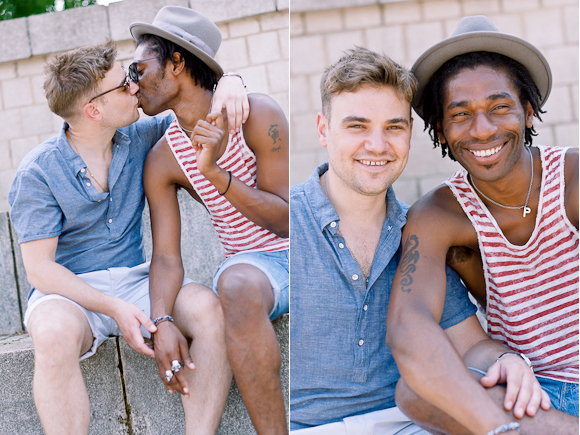 It was such an honour to work with amazing couple Patrick and Elliot back in the summer. Such fun and lovely guys, we shot around locations local to their home in East London. It's always important to me to get to know my clients before our shoot, and a privelage to hear all about their love story. Spending that time together first also really helps my clients to get into an open place, feel comfortable with me and the camera, so that the portraits we create together are natural, unfiltered and real. Aah, what a joy!! It's ironic that as a model agent who encourages others to jump in front of the camera and look great, I have never been comfortable doing the same. I rarely even take selfies and stand at the back when it comes to group pictures. My boyfriend on the other hand loves a picture. So it was a bit of a tough decision when We decided to be shot by Becky. We had only ever met once and now We were to display our personal relationship story and emotions for her to capture. I was nervous that morning, and more so because I wanted to do my best and ensure the images were great. Becky was really warm and friendly on arrival and straight away wiped away my worries because we spent the first part of the shoot chatting about various things. Her skill of getting my boyfriend and I to talk about how we first met and rediscover why we have been together for 13 years was so great. We got caught up in the love and adventure and most of all the comfort of working with someone who cared about us just as much as we cared for each other. The toughest challenge was subtle public display of affection when shooting outside as people walked by, as a gay couple this will always be a scary thing but Becky kept it natural and was always full of encouragement. In the end we were so relaxed we didn't want the shoot to end. It was such a cool experience and we would recommend it to anyone. If you know that you'd love to have some photographs like this with your partner, but feel unsure about the experience, know that what we'll create together is a safe space for you to relax and be yourself, and it's always so much fun! You'll come away with special photographs to cherish for a lifetime. Ready to book in your shoot with your beloved and have an awesome time in the process? Send me a message at becky@beckyrui.com and let's speak!